While it&apos;s a bit chilly outside, there are still 300 days of sunshine each year here in Austin. That&apos;s patio weather! One of the best patio views in town is on the south side at Red&apos;s Porch. 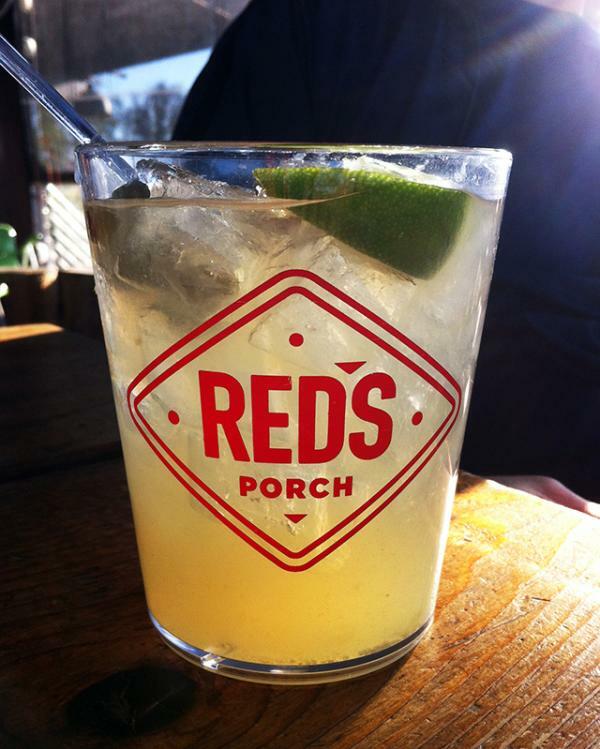 Red&apos;s Porch Margarita. Credit Susan Richardson. Climb the steps to the expansive patio overlooking the hills of west Austin and enjoy one of several Texas-style cocktails during their happy hour from 11 a.m. to 7 p.m. every Monday through Friday. My favorites: the house Texican martini and their house margarita on the rocks. On the food front, grab an order of fried grit cakes, Red&apos;s Queso Con Todo (queso with chopped brisket and guacamole, oh yeah) and the stuffed jalapeno & boudin basket. If you still have room for more, order the smokey goat burger (deep smoked bacon, fried onions & goat cheese) or the southern chicken fried chicken. And for those with a sweet tooth, split (or don&apos;t) a fried snickers. Open all week for lunch and dinner, or join for brunch on Saturday and Sunday. Be sure to check out their covered and heated porch this season!